When rolling with the cards in this great game called Super 21, it is good to know that Mr. Dealer will always hits on soft 17s. That won’t give you the edge by any means, but it’s good to know! Splitting is encouraged, but you should know that you can’t draw on split aces, and you can only re-split once, for a total of 3 hands. Doubling down costs the same as your ante bet, and is allowed on any two cards. 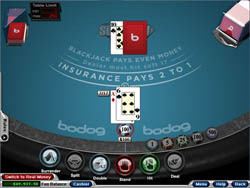 You can surrender at any time at a cost of half your bet, and Insurance is available to purchase in the event the dealer shows an ace. It costs 1x your starting bet. If you’ve ever played a game by RTG before, you know that you can expect quality graphics and gameplay. Actually, Super 21 reaches really quite close to perfection. The graphics are great – realistic, subtly animated, but not flashy or overdone. The game plays quick and smooth, with all the animations and flashy parts kept to a good level, so that they add to the fun of the game but never distract of slow things down. Plus, the layout is so well designed that it’s easy to learn, and once you load the game, you’ll be playing in no time at all. The designers did a fantastic job with this one! Pay close attention to the dealer’s face-up card, and let this guide your actions. Your goal is not always to come as blindingly close to 21 as possible, but rather to come closer to 21 than the dealer. You should pay just as much attention to the dealer’s cards as you do your own. The Bonus Payouts offered in Super 21 are what make this game great. They always seem to pop up when you’re on a downhill slide, and more often than not they save the day by bumping your bank back up to where it should be! This all happens in a well-planned, realistic game environment. Super 21 really offers everything you could ask for in a blackjack game, without compromising anything!